It’s almost a cardinal rule for film school graduates to cite Alfred Hitchcock as an influence, but the fact is that smart filmmakers have always stolen his ideas. Hitch, for his part, might have been the greatest thief of all—though, in the general accounting, he gave back more than he took. One such exchange that hasn’t been much commented on is that between him and director Jules Dassin (Rififi, Topkapi, and much more). 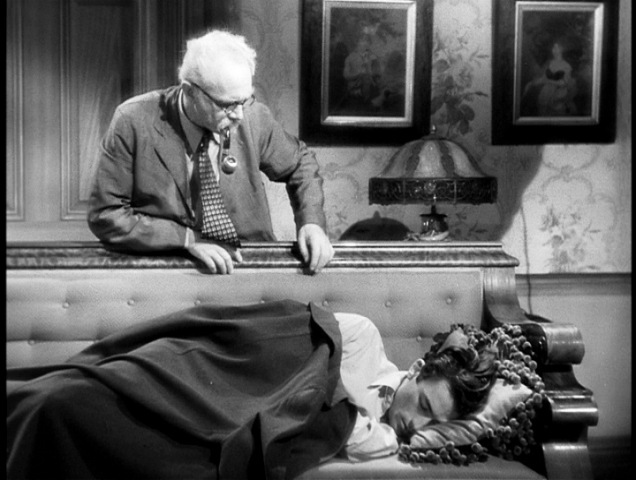 His very first directorial effort was a 1941 short adaptation of Poe's The Tell-Tale Heart. And if that assignment wasn’t Hitchcockian enough, its multiple tracking shots and subjective POV editing spoke to his careful study of the Master. Dassin’s extreme close-ups on the main character’s ear as he hears those phantom heartbeats come right out of the Hitchcock playbook. In fact, the entire 20-minute piece feels like an episode of Alfred Hitchcock Presents. For instance, there’s the scene where the oh-so Irish Detective Muldoon (Barry Fitzgerald) rouses suspect Frank Niles (Howard Duff) from unconsciousness. It matches the framing, action, tone and comic relief of the scene in Hitch’s Spellbound (1945), where the oh-so Viennese psychiatrist Dr. Brulov corners his wrong man, J.B. (Gregory Peck), for a round of questioning. In The Naked City, the bad guy, Garzah (Ted de Corsia) plunges several stories in this vertiginous shot. Apparently a dummy was used for the scene. 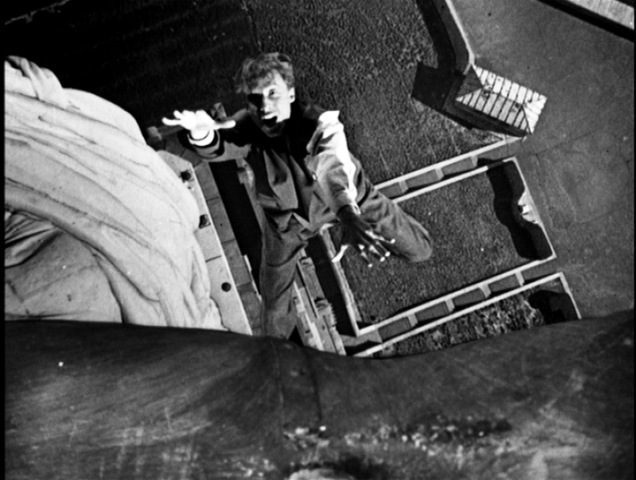 In a process shot layered with a tiny dissolve over his face, Frye (Norman Llloyd) exits this world from atop the Statue of Liberty in Saboteur. Introduce himself by name and deliver a prologue. Take the audience out of the cinematic experience by reminding it that it is watching a movie. Draw attention to their movies’ realism. Make claims that this movie is unlike any the audience has yet seen. Both films also take place in a New York that is both foreground and background, itself a character; and both are filmed in a neo-realistic documentary style. Perhaps most importantly, while both follow a police procedural format, Hitch’s film deals exclusively with the point of view of the accused—and that difference gives us a clue to Hitch’s greater intentions. If The Naked City did indeed exert some influence on The Wrong Man, the fate that befell its creator might well have also have been on Hitch’s mind at that time, too. Dassin’s career in Hollywood was cut short when, in 1951, he was accused of Communist activities and blacklisted by the House of Unamerican Activities Committee (HUAC). Like everyone else in Hollywood, Hitch very likely concluded that such blacklisting could easily happen to him. (See Lifeboat, which flopped in 1944 because it portrayed Americans and Germans alike in an ambivalent light. If Hitch had made that film at the height of the red scare, he’d have been run out of town.) For that reason, I see a connection between The Wrong Man and The Naked City, as well as Dassin himself. Call for the lady with the alligator purse." Hitchcock used that same rhyme twice in Marnie. In this latter case, it works on several levels, carrying forward ideas related to childhood danger, predatory animals, illness that is “nothing” and purses. 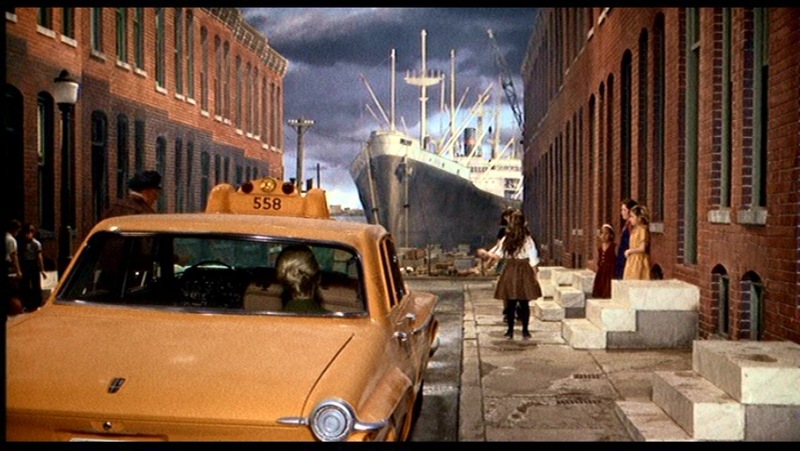 But the way the rhyme is presented in down-at-the-heels urban settings in both films also suggests that Hitch was again thinking of his former protogee’s film. The rhyme doesn’t appear in the source novel, Marnie, by Winston Graham; it was suggested by screenwriter Jay Presson Allen, who, according to Tony Lee Moral in his book Hitchcock and the Making of Marnie, “thought it would be funny and amusing.” Hitch would surely have known about its earlier use and smiled. By the same token, when Marnie Edgar coolly, methodically, robs the Rutland safe, the suspense, attention to detail and silence of that scene resembles the famous heist scene in Rififi, directed by Dassin while in exile in France. Hitch’s direction almost begs for that comparison. That’s speculation, of course. Still, one thing seems fairly certain: these two first-rate directors had enough mutual respect that they could riff on each others’ work, while following their own artistic lights. Interesting post, particularly the comparison between the couch scene in Spellbound and The Naked City. One thing that Dassin topped Hitchcock with, he married his Grace Kelly, Melina Mercouri. A fantasy perhaps that Hitch might have had. One further item of note on the latter, Dassin initially met Mercouri at Cannes and had a long-term marriage with Melina. Grace also had the same experience with Prince Ranier. So there is an additional bit of fairy tale to the Dassin story. As fans of Dassin note Mercouri played the leading role in many of his films, including Topkapi. Hey Jeff - Good to hear from you! Love the added details. Sometimes I wonder if Hitch had married his leading ladies (as directors are wont to do), how that would have affected his output. Certainly didn't slow Ingmar Bergman down! Joel, just a heads up so you can correct it, but ARTHUR Miller wrote THE CRUCIBLE, not Henry Miller. ARTHUR Miller wrote THE CRUCIBLE, not Henry Miller. Thanks, Doug! I'll fix that now. Thanks for this essay, Joel. I hadn't noted these parallels before but it's clear to me that Dassin took a lot from Hitchcock. Another tie-in I think is from the film "Rififi" in a way is almost a perfect hard-boiled film noir in my mind and I think owes more than a touch to the older master's work. Hitchcock's being a foreign national must have given some thought to being caught up in the blacklist, which would have been an absurd accusation but hoe many other artists suffered from guilt by association. I now see "The Wrong Man" in a very different light. Great job. Hey Doug! Thanks for stopping in. Yeah, I'll bet Hitch had a few sleepless nights about the HUAC. Just my guess.